From a young child I have been interested in Art and Painting. After high school I attended McPherson Technical College and studied dress design and pattern making, as well as fashion and figure drawing. After training I worked in the clothing trade as Patternmaker and Cutter for some years before having a family. I began to practice painting 18 years ago. With Lance McNeil I studied realist art, including figure drawing and oil painting. Since then I have attended water colour classes with Nina Dougal, Stan Thomas, Maxine Wade and Terry Jarvis, all water colour artists. As a Member of the Bendigo Art Society for many years, I have held position as secretary for three years organizing Exhibitions and Workshops with Demonstration Artists. Local Artists who have demonstrated are Geoff Paynter, Bill Beasley and Ross Paterson. Our Greek paint away was a great experience, and my first trip travelling to Greece. Each day was a new adventure with beautiful scenery and enjoyable company. 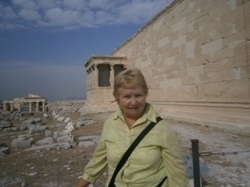 I have gained an interest in Greek History, Culture, and Greek food. The tutoring with Terry Jarvis was helpful, and to see how he approached each subject was inspiring.